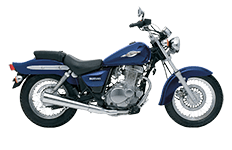 The Suzuki Intruder was introduced in 1984 and quickly grew into popularity. The Bike has quickly changed the Suzuki motorcycle line up. 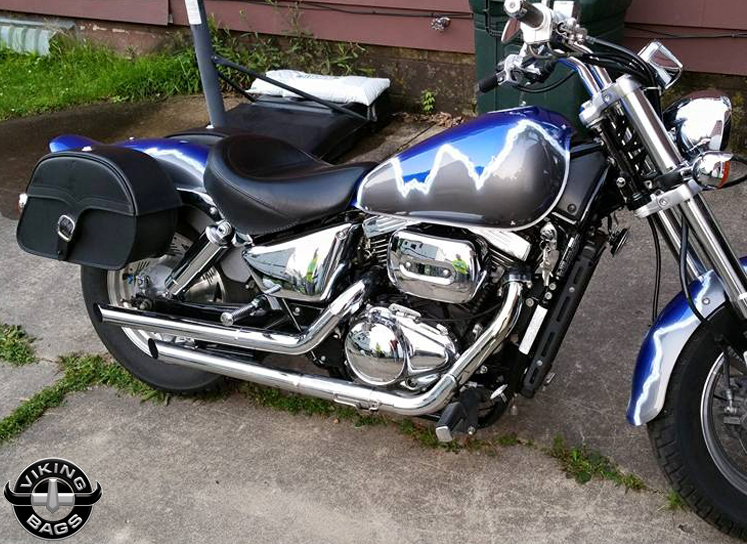 Their Marauder is also quickly one of the most popular bikes next to the Boulevard. Suzuki makes great bikes for reasonable minded customers. Here at Viking Bags, we offer saddlebags for reasonable minded customers who don't want to pay a premium price for high quality bags. Because we're riders, we know exactly what riders want. For example, since the marauder is small bike made for city commuting, Viking bags offers similarly sized side mount saddlebags that will directly be proportional to the bike. Combine the saddlebags with our quick release brackets so you're able to remove and attach the saddlebags as you please. Avoid theft of your valuables with our bags locking features. Our customer service representatives on are standby to assist you with your purchase. Viking infuses a few of their signature features into the Suzuki Boulevard hard bags, soft bags and other saddlebags to make sure riders are both confident and pleased with their luggage. For instance, the company's own innovative locking mechanism is included to ensure prevention of loss and theft when hauling down the open road, a particularly useful spec for riders traveling far away from home in unknown territories. Likewise, airtight construction helps protect the contents inside from poor weather conditions, and you won't find any leaks around the perimeter when the bags are fully closed. Every purchase of a Viking saddlebag for your Suzuki Boulevard comes standard with installation hardware and instructions, saving you both time and money when it comes to mounting luggage on your motorcycle. Riders of all levels and mechanical abilities should have no problem installing these saddlebags on their motorcycles with the basic at-home toolkit, but Viking also offers ways for riders to get creative. Riders can opt to use a quick disconnect system if they wish to remove and mount these saddlebags more often, while a turn signal relocation kit helps riders install these saddlebags wear the original turn signals are positioned on the bike. It's Viking's knowledge of rider customization that makes them ahead of the curve in every way. 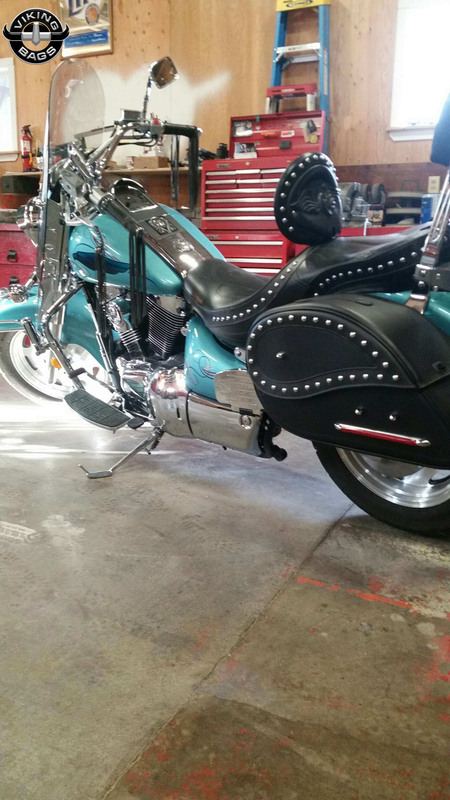 We understand that ordering saddlebags on the Internet can cause great worry and presents many challenges, especially if you have no prior experience to purchasing saddlebags. We want you to know that if you're not completely satisfied with the purchase of your new Suzuki Boulevard bags, we'll work hard until you're happy. We offer a full refund within the first 30 days of purchase, but we'll also provide a bit of guidance and find you a pair of saddlebags for your Suzuki Boulevard that you can really appreciate. That's our promise to you, every time you order! Viking wanted to create more than just a saddlebag for GZ250 Marauder owners, and you'll find just about every type of accessory available throughout the various models listed on this page. No matter if you're a studded kind of rider or prefer smooth, modern lines, we've got you covered. But you probably didn't realize that every square inch of these saddlebags is constructed to improve the weatherproofing nature. From the heavy-duty seams that line the exterior to the company's own leather and Cardura materials, you'll quickly see how durable these saddlebags truly are. Test them out in the harshest of climates, from rain and snow to sleet and hail, and your bags hold up. Of course, each model features their own set of individual styling and accessories to get the job done, as well. One of Viking's most attentive construction methods with these saddlebags is safety. Not only is your luggage protected from the padded interiors of the saddlebag, but the design itself is meant to flow with the stock lines of your GZ250 Marauder. Leg room is not sacrificed, therefore you can travel farther without the hindrance of moving erratically. One of the biggest safety features that Viking included was their own locking mechanism, allowing riders to lock down their goods when they step away. Velcro strips also improve the airtight seal around the perimeter of each model featured in our online collection. Want to know more about our products? Give us a call and tell us what model you're most interested in purchasing. We sell every saddlebag with free mounting hardware, installation instructions and a 30-day money back guarantee to help you improve shopping confidence. 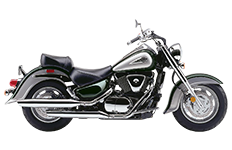 Once you start exploring the many different models of saddlebags we have to offer the Volusia 800 motorcycle, you'll quickly see all the great features that are available. From adjustable straps with chrome-polished, stainless steel buckles to mesh pockets for better organization, riders get more than just a convenient side saddlebag for their bikes. Viking might provide an affordable alternative to on-bike luggage, but they use their heavy-duty leather for a high-quality, elegant finish. It's true that every model we feature here has their distinct advantages over one another, but everything you'll find in our inventory uses the same uniform design aesthetic. Designed for Suzuki Volusia 800s by engineers who understand the mechanics behind the bike, giving you the most comfort when you mount. 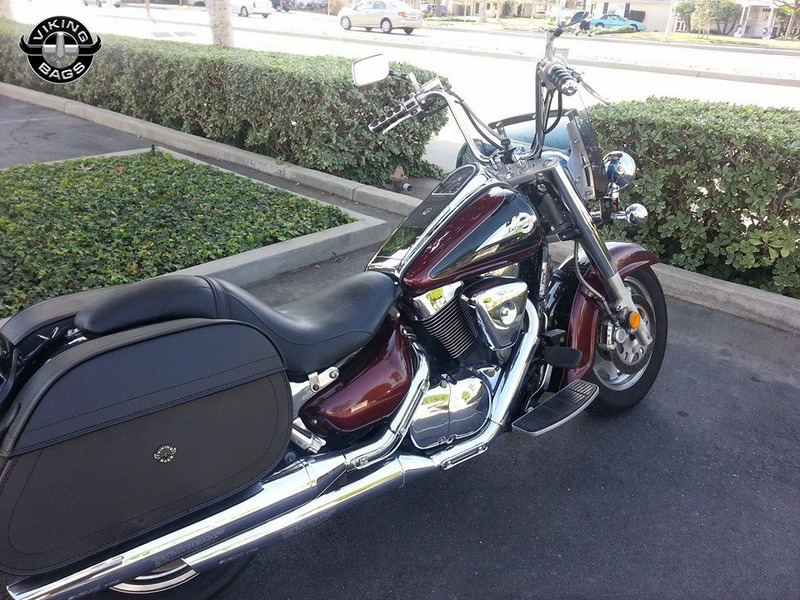 Above all else, Viking designed a collection of Volusia 800 saddlebags that stand for secure storage. By combining their locking mechanism with Velcro strips, riders can make sure their bags are closed tight and locked away from prying eyes. Simply use the personal key that comes with your bag to unlock! Of course, other safety measures are included, like the ABS-plastic backplate that's fixated to the rear of the saddlebag where it meets the motorcycle body. This helps prevent bumps in the road from rattling around your luggage, improving shock absorbency and keeping riders happy. To better help you make a decision for your motorcycle, we sell all of our saddlebags with a 30-day money back guarantee. Take the free mounting hardware (a $100 value) and installation instructions that are included with the bag and install on your bike. Test them out, get a feel for how great they can make your bike and let us know what you think. Your satisfaction is one of our highest priorities!